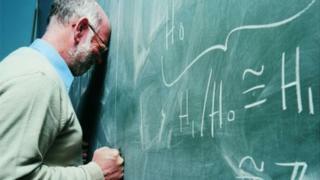 One in 10 teachers say they have been prescribed anti-depressant drugs to cope with the pressure of their jobs, says a teachers' union survey. The NASUWT survey of over 5,000 teachers found 22% had increased their alcohol intake and 21% had consumed more caffeine in response to stress. The poll found 7% had used or increased their reliance on prescription drugs. The findings come as the NASUWT's annual conference debates the impact of workload on teachers' health. The union will debate a motion at the gathering in Birmingham calling on members to condemn the government and employers "for their inaction on tackling excessive workloads, which is reported as the major cause of stress". 2% of teachers said they had self-harmed as a result of work-related pressures. "On tablets for depression and anxiety. Constantly exhausted. Normal 10 or 11 hour day in school then work at home." "Overly tired, poor sleep patterns, no quality time with family, constant worry, heavy work load 70-80 hours per week, irritable and less patient." "Suffering anxiety and stress. Currently taking anti-depressants to overcome depression, brought on by the pressures of the workload and job." "Higher dosage of anti-depressants prescribed just to get through the day. Love the pupils but my senior management team are bullies and manipulate staff." "Now taking anti-depressants. I feel undervalued and unable to trust work colleagues. Stress levels have increased which has impacted upon my interaction with students and the quality of my teaching. I do not enjoy being in my current school and am seriously considering leaving the profession." Chris Keates, general secretary of the NASUWT, said: "Yet again we have shocking figures about the toll the job is taking on the health and wellbeing of teachers and school leaders. "It is unacceptable that given the increasing scale of the problem, there is still no sign of either employers or the government taking any effective action to address this. "Instead of offering support, in far too many cases we see employers introducing punitive and callous sickness absence policies. "High quality education cannot be delivered by stressed and anxious teachers." A Department for Education spokeswoman said: "We know unnecessary workload is one of the biggest frustrations for teachers. "We are working with the profession and education experts to take action on the root causes of teacher workload, including through the first biennial teacher workload survey and looking in depth at the three biggest concerns teachers have raised - marking, planning and resources, and data management."